Where does it come from? Where does it go?! I’m great at finding motivation for a few weeks at a time – then it seems to drift off somewhere. I’ve spent the last hour wandering from room to room trying to fix on something to ‘get done’ (in an after-school/weekend project style) and failing. I’m aware I probably give the impression of being very motivated and organised. Don’t be fooled. I make lists not because I am organised but because I am not. Remember my shopping trip to IKEA last September? A lot of that stuff is still in bags in my hallway, waiting for…? PS I don’t want to give the impression that I am doing everything by myself. I tend to do all of the organising, decluttering and so on. Husband does the stuff I have no clue about – basically anything invloving heavy lifting or a tool box. Also my parents have given us a lot of help with mending things, making curtains and so on. It’s just that I am the planner, thus if I don’t make a plan and get the ball rolling..! Nope – for once this isn’t a post about money going down the plug hole – just regular water! We’ve had all sorts of problems since our bathroom was fitted (not very well as it turns out) about 6 years ago. Water never drained very well from the sink and then the mechanism broke that lifted the plug up and down. And then we were given some kind of toxic solution to try to clear the pipes which sort of worked except it took the silver finish of the plug hole. Thus we gave up on the plug altogether and have been washing, for far too long, from a running tap. Dad had a fitting left from when he installed my parents bathroom and, today, he came up and fitted it. While he was at it, he also did something (don’t ask me what – this stuff makes no sense to me) with the pipes. Hey presto – the water now drains away properly and the sparkling new plug/plug hole fitting works perfectly. Remember how I said I was going to have a month of spending rather than a month of saving? I’m not convinced it is any less complicated than trying to find ways to save! I’ve spent most of the morning trying to unravel what has been paid so far and what hasn’t. I ordered my boots from Next but they won’t let me pay for them until next month because the statement isn’t ‘out until then (What?! Don’t they want to be paid?) and I’m still chasing Office for my refund – I posted the other boots back nearly three weeks ago and they still haven’t given me my cash back yet, which I need to put towards the other boots. Grrrr. The garage hasn’t found out if they can return a part ordered for the ‘dead’ car so they can’t tell us what our total bill will be so we can’t pay that either. The plumber wanted me to pay by bank transfer but it won’t work (long story) so I’m having to send a cheque. Gah! Why is nothing bloody simple? I haven’t even thought about buying the replacement lamp. At this rate I’m just going to stick some money for it into our Home Improvements fund and deal with it another time – I can deal with a dark corner for another month or so. In addition to this we’ve spent the last few days working out how to scrabble the money together for a replacement car for husband so we can give back the car borrowed from our friends. I think we can do it, it just involves a lot of hassle, phone calls and moving things around. Husband has already been up for two hours trying to look at cars which keep being sold before he gets there, people keep changing their minds about prices/offers they are willing to accept, whether vehicles have tax and so on. Much in the vein of one thing after another, did I mention that my ‘new’ employers (despite initial discussions around Christmas time) have now informed me that they are not going to pay me for my maternity leave? I am now trying to get them to fill in bits of paperwork so I can try to claim for it. It should be okay though, even in the best case scenario, I now won’t get 90% of my usual salary for the first 6 weeks as previously discussed. This is on top of the paperwork I am bogged down with in trying to claim back money owed from my old job. Obviously, I’d like to add to that a finished house and about a hundred other things. However, the above would do nicely! My after-school project for today was finishing the paper shredding which is now all bagged up, ready to go in the recycling. I only had so much to do because I had such a big clear out. Hopefully I can do it bit by bit from now on. I didn’t tackle anything more ambitious because I decided to get the weekend cleaning done a day early and, frankly, there’s only so much of an evening I’m willing to give up on doing chores! Actually, it seems like all I’ve been blogging about lately is getting chores done. This is probably because I find I’m more likely to actually get on and do things once I’ve committed to doing something on here. So I’m sorry if it is getting dull but I’m finding it too useful a tool to give up at the moment! Anyway, it’s only 7pm and I’ve got the rest of the evening to be lazy. I’ve got a good book to read in the bath (yup, one off the ‘unread’ shelf, not a new one!) and a chicken korma from the freezer so no cooking and very little washing up. Perfect! While I haven’t finished everything I’m quite pleased with how much of this I actually managed to get done. The shower curtain/pole combo I want to get isn’t in stock at the moment plus I need to go and pick it up on a weekend so I haven’t managed to get this done. I expect I’ll get around to it in the next few weeks. I’ve decided against going the bathroom woodwork for now as a couple of other things need ‘doing’ in there first so this will probably be done last of all as a finishing touch. So not bad all round. I won’t be doing a February list because I need to be quite flexible about what can and can’t be done over the next few weeks. However, I will be keeping up with my ‘up to an hour’ after-school projects and my 50 Home Improvements as it seems to be spurring me on. Someone tell me this house will be finished sometime soon! The thing is – proper maternity wear fits, well, properly. No pulling things up/down all of the time, they look much better and are sooo comfortable. While quite a bit of my current wardrobe can still be worn for a while, looking around the shops made it obvious, pretty quickly, that buying anything else that was non-maternity was going to be a waste of time. I went to a few other shops to see what they had (answer: not a lot) when I finally hit H&M. I have to admit that, while Husband always manages to find treasure here, I haven’t had much luck with it over the past few years. Today, however, I felt like I had struck gold. A brilliant range of maternity stuff, all very wearable and all at very good prices. I got a couple of cardi’s and a couple of tops. I stuck to things that I can wear either at work or at the weekend so I can get maximum wear out of them. Plus, I made sure I picked things that will expand as I get bigger and also go the other way as I (hopefully!) lose weight once the baby is born. Don’t worry, I’m not one of those mad people who think they have to lose weight as soon as they’ve given birth. But I will lose it eventually and I have bought things that will accomodate both my weight going up and then down again. One of the tops is plain black, long and very stretchy so I will be able to wear this underneath my non-maternity cardigans as well as on its own. I didn’t even get to trousers. I think I will order a plain pair from Next at some point. If they are anything like as comfortable as the maternity tops I might do it sooner rather than later! In the end I didn’t spend very much at all but it felt like I did because I haven’t been clothes shopping in such a long time! I’m really pleased with every single thing I bought. I also picked up a gorgeous silk rose brooch that looks gorgeous with just about everything. Lucky me, I got given some new necklaces and earrings at Christmas so I can mix all of these things together and be kept very happy for quite some time! As for my after school projects, I’ve made a start on shredding some of the mountain of paperwork left over from my big clearout. I haven’t finished yet – my shredder only takes 2 sheets at a time so it might take me a couple of goes to get through it all. However I have managed to fill two carrier bags so far. I think I can put this in my recycling box but I need to check. I’ve also put together a bag of bits and bobs to take to the charity shop. I should say I’m not usually quite this motivated – these fits of home improvements and decluttering usually only occur now and then. I can be really on the ball for a week or two and then my motivation tails off. However, my due date, while still some months off, is getting ever closer and I know I just won’t have time once our baby is here so I really have got to get on with it! The goal I’ve been working towards (on and off) for the past year or so, has been to only have the things in our house that we either really love or need/use. Though I love the idea of a minimalist home I know it is never going to happen. I like bits and bobs too much – lamps, candles, vases, bowls, funny knick-knacks and so on. It’s really all about clutter – or lack of it. What drives me mad is struggling to keep on top of things/not being able to find things because what storage space we do have has been taken over by stuff we don’t actually need/want. I’m not convinced that it is possible to be completely decluttered all of the time. I think it has to be more of an ongoing process. That said, I would like to get to the point where I’ve got rid of so much of the unwanted stuff that I can just do a little bit now and then to keep on top of it! My first ‘after school project’ is finished. Don’t things change once you’ve got a digital camera? I’ve got literally hundreds of photos stored digitally these days. At some point I’m going to decide which ones to get printed and put them into albums but not any time soon – I don’t need any more projects at the moment! During various bouts of decluttering I had gradually put years worth of photographs into a drawer in the living room to be dealt with at some point. When I cleared the bookshelves I discovered two unused photo albums so I decided I might as well just get on and fill them up. One I used for holiday photos and the other is a seriously bizarre mix of photos spanning more than a decade – gigs, parties, christenings, DIY projects, weddings all jostling together between one set of covers. I figured I might as well throw them all together because I was never going to buy individual albums for them all. It’s kind of fun to look through though. The remaining photos and negatives have gone into a storage box – one of the ones freed up by my DVD cover cull. There is plenty of room left inside for future prints which is good. Clearly I need a lot of time to get around to putting photos into albums! I now have an empty drawer in the living room which I’m sure will come in handy over the coming months. We painted the bathroom walls yesterday so another job can come off the list! I’m not sure what I dislike about painting the most – the act of doing it or having to move stuff around and make/clear up a big mess. I think probably the latter. The actual painting only took about half an hour (not including the sanding) as it is a very small room. It is mostly tiled so we only had to do one and half walls plus the tongue and groove bath panel. Mo from over at Get Stuff Done suggested we have a go at painting just one little bit at a time. The bathroom needed so little doing that it was easier to do it all in one go, but I’ll be trying out this idea – particularly with woodwork. Although our home is small it seems to have a lot of doors, all of which could do with a coat of paint. One bit at a time seems like a good plan so thanks for the tip Mo! By the way, the new filing system is working like a dream. I’ve got the files on a shelf on the landing and it is so easy to put things away as soon as they arrive. The best £7.80 I’ve spent in a long time! Husband and I sat down last night and did a spot of planning. I’m still slightly horrified by how much there is to do. A lot of it, realistically, can only be done at weekends. I’m finding this a bit frustrating as I want to get on with it – the clock is ticking. Not one to be easily defeated, I decided that another list was in order. I’ve called this my ‘after-school projects’ list. Basically this is for small things I can do that will either help us to be ready for the weekend DIY bursts or for general decluttering and so on. Each of these things should take an hour or less. That way I can either get on and do something useful (rather than going around in circles) or ignore it and have a day off. I’d like to think I could find up to an hour most days to get something done until it is all finished (this is where Mo’s tip might come in handy). I had a bit of time last night before I had to get ready to go out so I started sorting through some old photos. They are a bit of a random collection and I’m not sure they’ll ever find their way into an album so I’m thinking of finding a suitable box for them to go in. I didn’t get it finished but I decided to just do as much as I could in half an hour so at least I’ve got a start on it! Trousers: My belly band now fits! It is seriously comfortable and means I can carry on wearing all of my regular trousers from workwear to skinny jeans. I also bought a pair of maternity jeans in the Next sale for £10 a few weeks ago. They are a bit big but fortunately the waistline sits under the bump so I can keep them up with a belt. I expect I’ll need to buy a pair of black maternity trousers at some point but I don’t need to as yet. Tops that don’t really fit: I’ve got a lot of work shirts and fitted tops that, while I can get them on, don’t actually look any good so I have packed them away in a drawer. Stretchy tops: I have a good selection of tops in jersey fabric which all still fit. I’ve hung all of these in my wardrobe so I can see exactly what I’ve got. Some will probably only fit for another month or so – some a bit longer. I’ve decided that the way forward is cardigans worn open with plain, stretchy tops underneath. That way, I can buy a couple of non-maternity cardi’s that I will be able to carry on wearing after my due date – a much better investment! A colleague was having a clear out last week and gave me a nice navy cardi from Topshop to add to my collection. I’ve had some odd tips from people, like wearing my husbands clothes. Er. This might be okay if I was about a foot taller! The other issue is, I have a job where I need to look smart and professional and I’m just not going to get away without buying a few things. I ordered a pair of boots from Next (to replace the ones that can’t be fixed) and, since I was paying the delivery fee anyway, I decided to grab a pack of maternity T-shirts while I was at it. They aren’t the most exciting garments in the world but I think they are a good buy. Three cotton T-shirts (one black, one white, one green) for £12, so just £4 each. As they are plain I can dress them up or down so they will be good for work or at home (and will go with my cardi’s!). The second part of the quest involves making better use of what I’ve got generally. While I’ve had a sort out based on my maternity ‘needs’ I’ve also decided to try and get more use out of all of the other things I own, namely accessories. I have a lot. And I mean a lot. Except I seem to get stuck on wearing the same few pieces again and again. While there’s nothing wrong with going through a phase of loving a particular thing, in my case it is a bit of a waste. I’ve got some lovely necklaces, earrings and scarves that I hardly ever wear and yet I do really like them. This also goes for make-up. I seem to stick to a couple of favourite eyeshadows etc and wear them every day instead of having a go with some of the other things in my make-up box. I know a couple of people who put out what they are going to wear the night before. This is an idea I’ve always liked but have never managed to stick to for more than two days in a row. However, I’m going to give it a go over the next few weeks, at least during the working week. I really want to make sure I am getting the full use out of the clothes, accessories and make-up that I already own and I can’t deny that having made a bit more of an effort puts a spring in my step! Am I alone in this or does anyone else seem to end up wearing the same things over and over, leaving other things languishing in cupboards? Do you make the effort to rotate your clothes (other than seasonally)? Any tips for putting together new combinations out of existing ‘stock’?! And any tips for good things to invest in if you are pregnant? 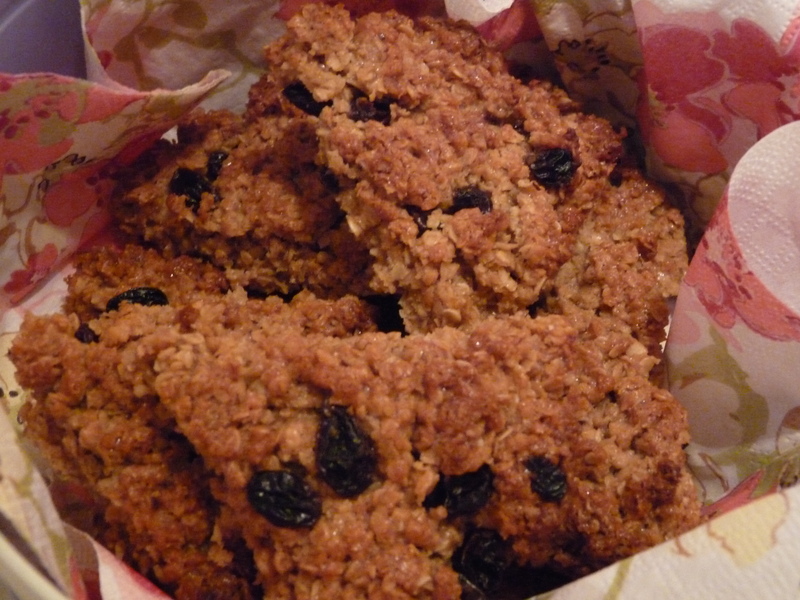 Flapjack is one of my favourite things to make. Not only are Husband and I big fans of it but you can usually throw a quick batch together using things from the cupboard and it is so, so easy to make. I know a lot of people who say they can’t bake so flapjack is a great compromise – it only takes about ten minutes to get everything together and then another 15 minutes in the oven. Heat oven to 180 degrees/ gas mark 4. Melt the butter in a large saucepan over a low heat then stir in sugar and syrup until dissolved. Add the oats (and any extras) until the mixture is really thick. I keep adding oats until I am only just able to cover them. Transfer mixture into a greased tin and pop in the oven for 15 minutes. Cut into pieces while still warm though don’t try to take the pieces out of the tin until they are cool and fully set otherwise they fall apart. By the way, don’t be fooled into thinking it hasn’t been in the oven long enough because it seems soft. If you leave it in the oven longer than 15 minutes it will probably break your teeth as it sets as it cools down! For ages I didn’t have a large baking tray so I used two cake/sandwich tins. The above recipe makes around 12 pieces. They last for days in a tin or airtight container so they are great for adding to packed lunch boxes. I also like making a quick batch if we are visiting friends or people pop over on short notice. On a completely different note, I’ve managed to get some good bargains in Boots this week. Their Christmas stock has now been reduced by a whopping 75%. I bought myself a gorgeous make-up bag to keep in my handbag. It was reduced from £15 to £3.75 and came with 4 make-up brushes, some eyelash curlers and a cute pair of spotty tweezers. My make-up bag had been looking a bit sorry for itself so I was very pleased with this! I also bought a perfume set reduced from £16 to £4 and some lovely wrapping paper reduced to 75p – a serious bargain. I had a couple of £5 No 7 vouchers so I got some eye make-up remover reduced from £7 to £2 and also a pack of wipes (that cleanse, tone and moisturise in one go) reduced from £6.50 to £1.50. I don’t usually use them but I thought they might come in handy in a few months when I’m pushed for time/sleep deprived. Anyway, there are some great buys to be had in Boots at the moment (though I imagine stock will vanish at the speed of light) so it might be worth having a look, particularly if you want to get some birthday and Christmas presents to stash away. I saw nice little sets of make-up and skin care starting at just £1.50!